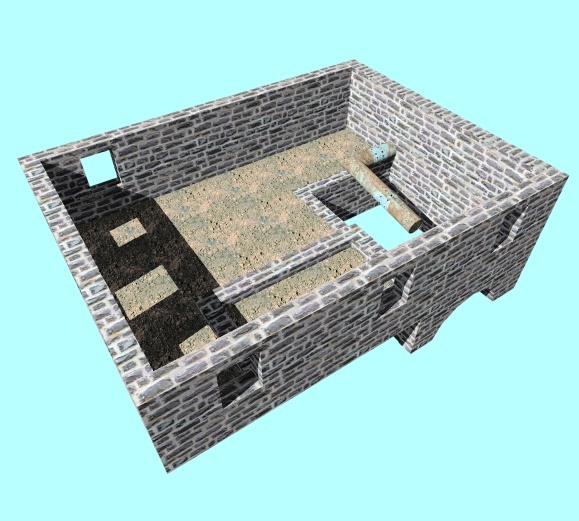 The ruins of the mill foundation and the remaining pieces of machinery were carefully measured and photographed, then accurately solid-modeled in AutoCAD 2000. The illustrations used here were generated from renderings using Accurender and finished in Photoshop. For more detailed photos of the ruins as I found them in 1993, see "The Mills of Brodheadsville". 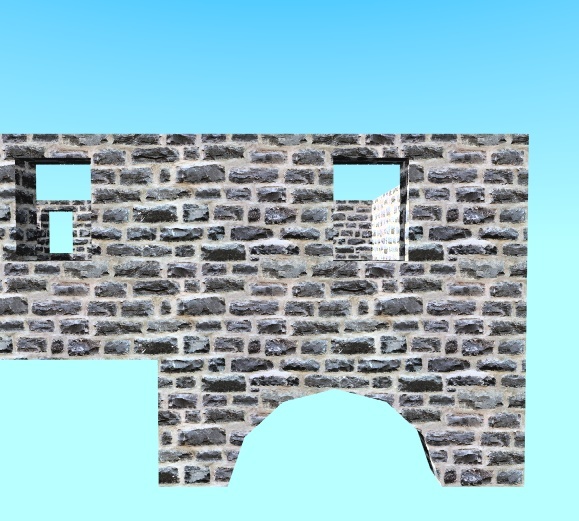 The intent of this section is to show how the mill was constructed and how it once looked when new. 3 dimensional model used to generate illustrations. Above, foundation ruins, showing collapsed rear wall, as found in 1993. The foundation walls were constructed using local fieldstones. A 24" diameter flue pipe was put through the rear wall. 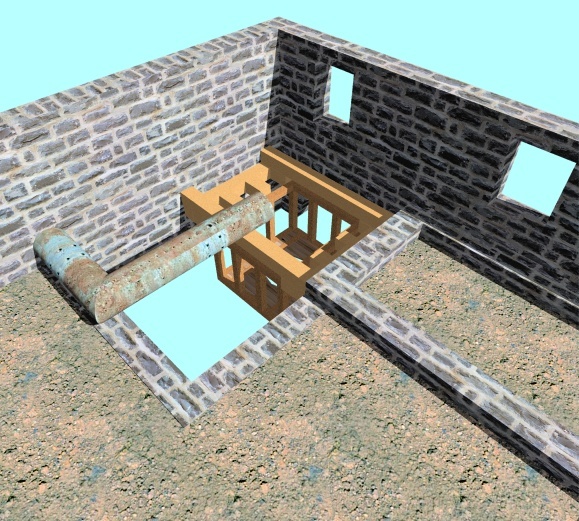 This pipe would carry the water from a holding pond located behind the mill and lead it directly into the turbine penstock which was a box holding the water turbine within it. 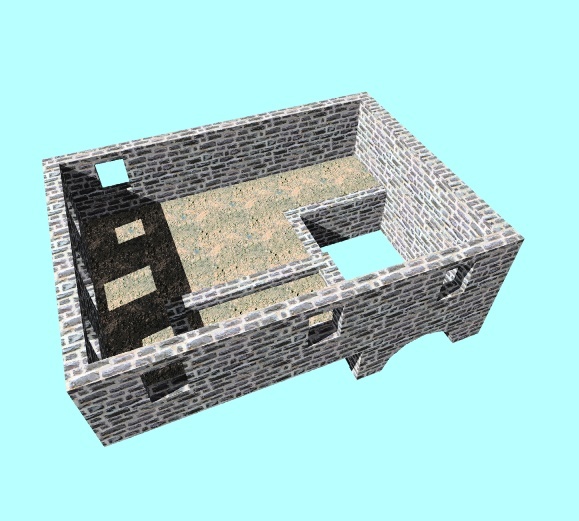 The north wall of the mill ruin is where the Mill's tail race exit was located. This is where the water, after having passed through the turbine, exits the mill building. The water that left from this arched discharge opening flowed back into McMichaels Creek about 60' down stream from the mill. After the mill foundation was built, the mill wheel was installed and a "Race" was constructed. The Race was a small canal used to lead the water from a mill dam located upstream to a collecting pond at the rear of the mill. This race way was created by digging into the side of a hill that followed the creek bed, and using the excavated dirt to build a wall parallel to the hill. The hillside conveniently provided one side of the race. Usually grist-mills used large water wheels being of either the "under", or "overshot" variety. 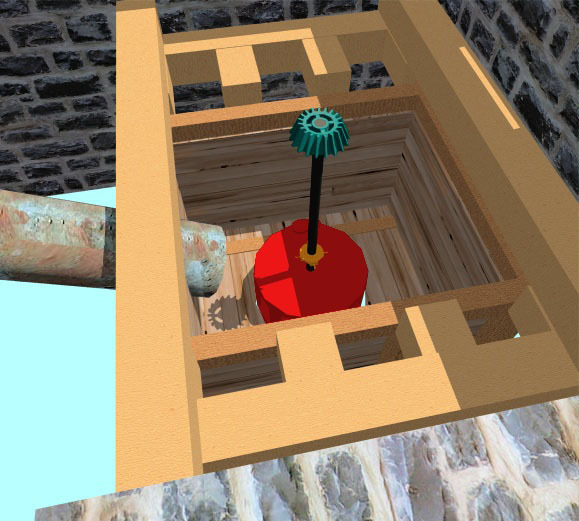 The names implying how the water encountered the water wheel buckets, either by going over the top of the wheel or from the bottom of the wheel. 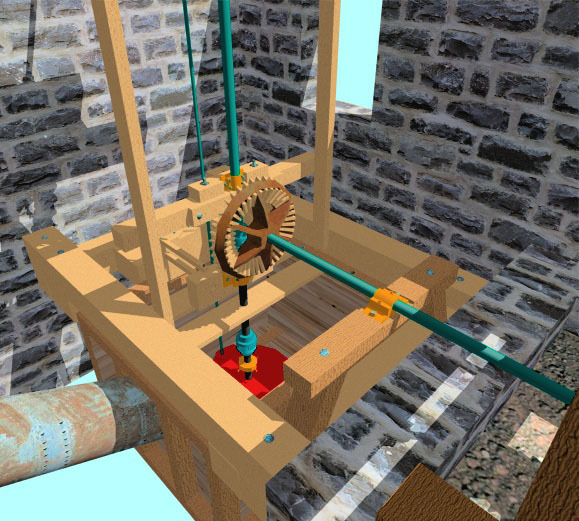 The RED MILL did not use a standard water wheel, but instead used a WATER TURBINE. Water was directed from the collecting pond to the turbine penstock by a large diameter pipe. The pipe passed through the rear mill wall and led the water into the penstock in which the TURBINE was located. See below. The water turbine was situated in the lowest area possible so as to increase the height or "fall" of the water. 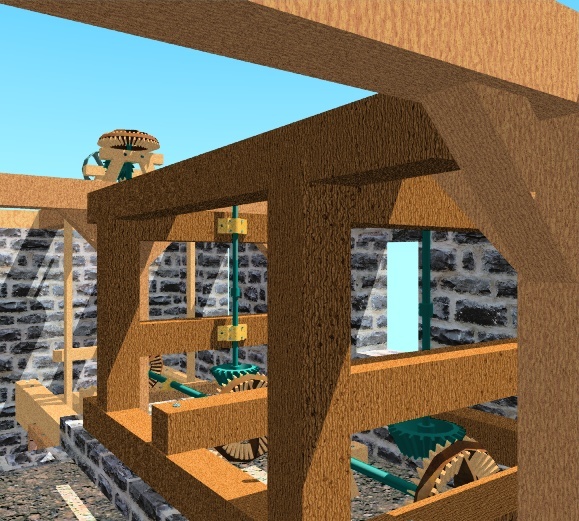 A large wooden frame called the "HURST FRAME" was constructed to support the weight and withstand the vibrations of the gear systems and the millstones they were turning. The Hurst Frame, as shown in these illustrations is colored a darker brown. 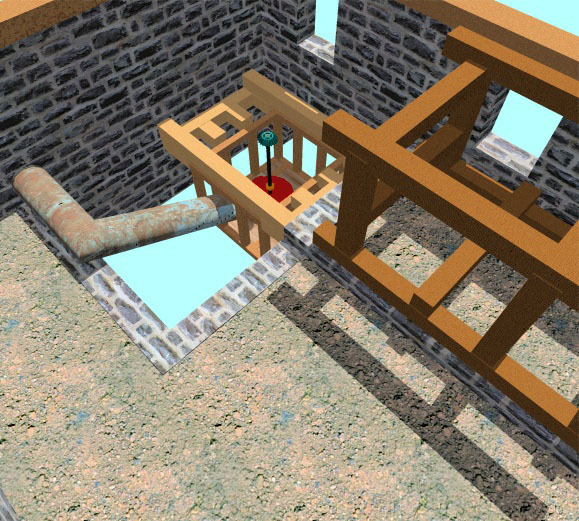 The water turbine (red) was contained in a square penstock, a box which forced the water to pass through the turbine's blades causing the turbine blades to rotate providing the working power for the mill. The appearance and construction of the actual Hurst frame used in this mill is unknown. The above illustrations show water turbine's from contemporary illustration. A Leffel turbine is on the right. The arrangement of the turbine and penstock was typical of how a turbine was mounted. The turbine in Geisinger's Mill was similar but of a different construction. As of this date, I have not been able to positively identify the manufacturer of the Geisinger turbine. Notice that the top coupling shown in these illustrations called a "jaw" coupling is identical to the type found at the mill site. 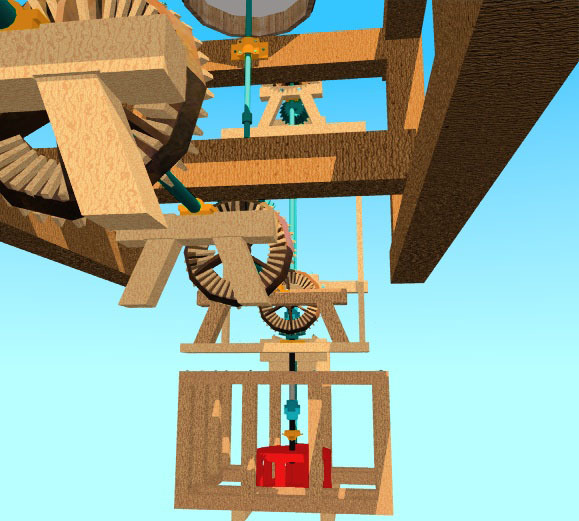 This view shows the turbine (red) and associated machinery. 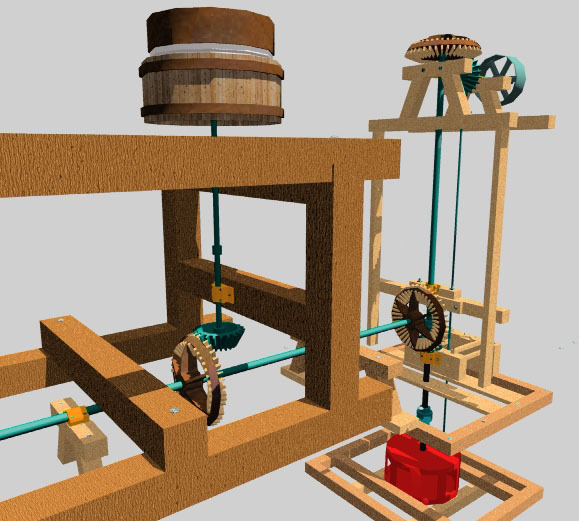 On the left center of the photo is the "HURST" frame (dark brown) which supported the transfer gearing and the heavy gristmill stones casings located above it. 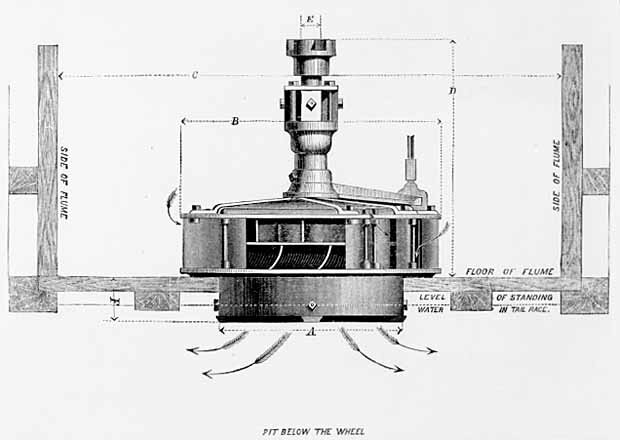 The massive timbers used in the HURST frame helped reduce the vibration of the turning millstone wheels. 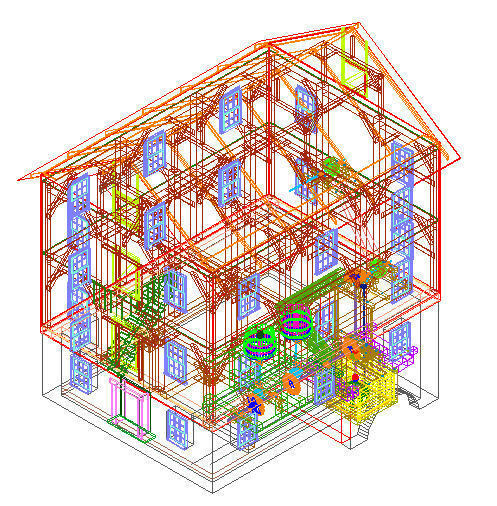 It was a separate structure from the mill building thus reducing the transfer of vibrations and noise into the building itself.